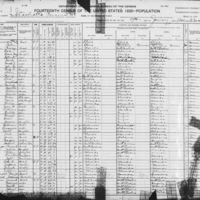 The census population schedule for Istachatta, Florida, in 1920. Individuals are identified by name, titles and terms, gender, age, marital status, race, relationship to head of household, birthplace, birth year, the last place of residence, and occupation. A notable resident listed in this record is Willis H. Hawkins (ca. 1919-1944). Hawkins lived in Istachatta for much of his life and was educated up through grammar school. He worked as a semi-skilled driver or chauffeur until he enlisted in the U.S. Army on October 20, 1943. Private Hawkins served in the 3rd Infantry Division's 3rd Reconnaissance Troop. The 3rd Division participated in Operation Dragoon, in which the Allies invaded southern France, and then traveled North towards the Rhineland. Pvt. Hawkins was killed in action on November 2, 1944. He was awarded a Purple Heart for his service and was buried in Epinal American Cemetery and Memorial in Dinozé, France. Originally published by the Bureau of the Census. distribute copies or digitally transfer the work to the public by sale or other transfer of ownership, or by rental, lease, or lending. This resource is provided here by RICHES of Central Florida for educational purposes only. For more information on copyright, please refer to Section 5 of Copyright Law of the United States of America and Related Laws Contained in Title 17 of the United States Code. "Willis H Hawkins." FamilySearch. https://familysearch.org/ark:/61903/1:1:MNY2-1KS. "Willis H Hawkins." FamilySearch. 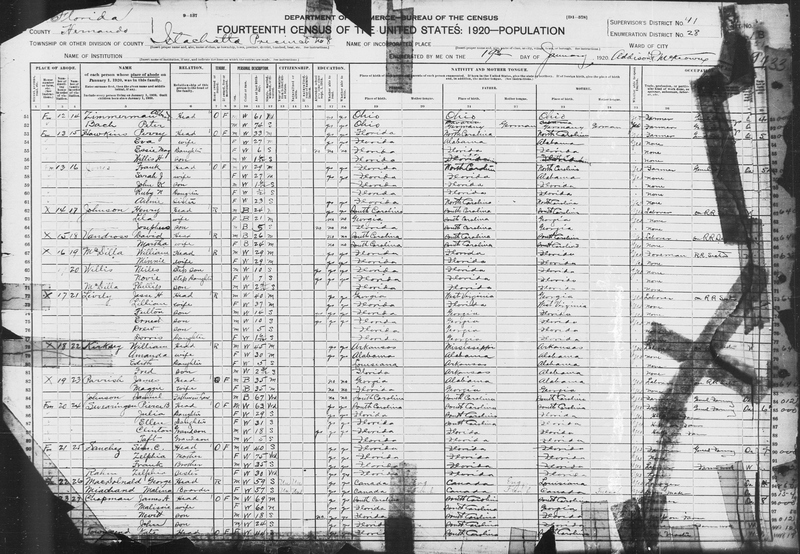 https://familysearch.org/ark:/61903/1:1:SRBG-5ZM..
“Fourteenth Census Population Schedule for Istachatta.” RICHES of Central Florida accessed April 18, 2019, https://richesmi.cah.ucf.edu/omeka/items/show/9299.